The National -- As a former British Royal Marine, Nick Watson is used to gruelling physical ordeals. In a five-year career with the UK military’s elite amphibious fighting force, he was deployed all over the world, including to Kuwait in the aftermath of the first Gulf War. But on Sunday, the ex soldier is set to embark on what he describes as the biggest challenge of his life. 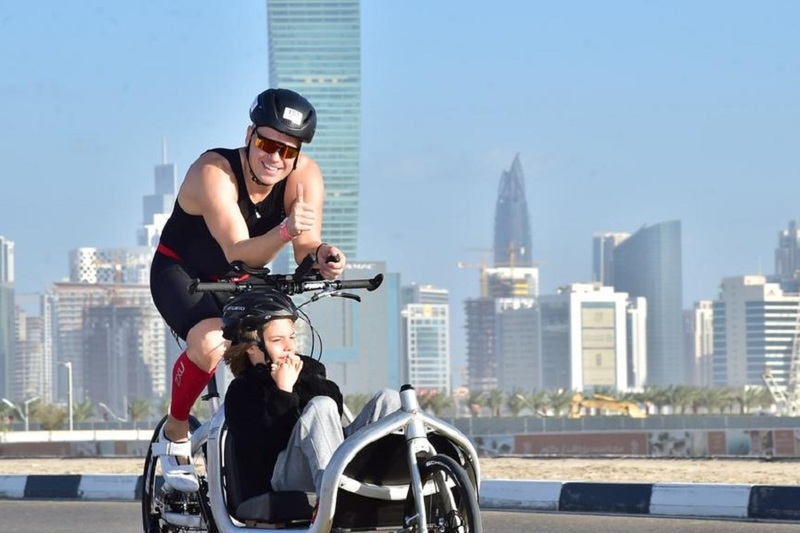 He is aiming to complete seven 113km triathlons, over seven days, in seven emirates. And he will have his disabled son, Rio, for company every inch of the way. Each day, Mr Watson will pull his son in a kayak during a 1.9km swim, cycle using an adapted bike for 90km and then run for 21km pushing Rio in a special chair. The remarkable challenge will see the father and son team travel just under 800km in just one week. Their aim is to raise awareness and acceptance of those with learning disabilities, or ‘people of determination’ as they are known in the UAE, ahead of the Special Olympics held in the country next month. The pair will set off from Fujairah and aim to finish the challenge in Dubai on February 16. For the last kilometre in each emirate, they plan to walk so that others can join them. “This journey will represent the biggest challenge of my life,” Mr Watson, 49, said. “Taking my boy Rio, who is a person of determination, across all seven emirates aims to raise awareness for the inclusion movement through sport and inspire a healthier global community. Rio, 15, has 1q44 Deletion De Novo, a rare chromosome disorder, which means that he has trouble with walking and speaks mainly through sign language. However, one of the phrases he can say is ‘dada, race’, which Mr Watson said shows Rio’s passion for the outdoors. It is expected to take them seven hours a day to complete each triathlon. Mr Watson has already set his sights on his next father and son challenge – a full Ironman triathlon in Hawaii next year. That race is widely considered to be one of the most difficult one-day challenges in the world. It involves a 3.8km swim, 180km cycle and 42.2km run. He does not race without Rio. Mr Watson, who has lived in the UAE for 20 years, said he had seen attitudes to people with learning disabilities in the region improve since Rio’s birth 15 years ago. He said he hoped the Special Olympics in Abu Dhabi, which will see over 7,500 athletes from nearly 200 nations compete in a high-profile event, will usher in further progress. Mr Watson, along with his wife, Delphine, and daughter Tia, 12, are part of ‘TeamAngelWolf’, an entity set up by the family to promote inclusion of people with disabilities and health. More details of Mr Watson and Rio’s daily location, as well as details on how to join them for their last kilometre of each day, will be shared on the TeamAngelWolf social media channels.